Written by Magnus Jepson on February 20, 2009 Product news. 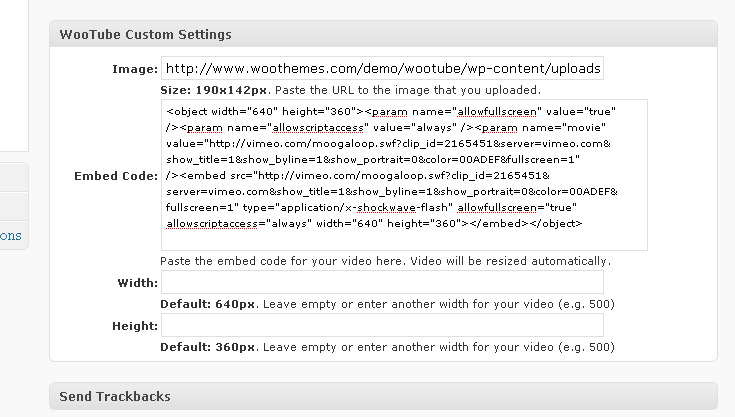 When we first designed WooTube, we only intended it to be a simple video browser theme. Some complained that the homepage looked like a single post, probably because that is exactly what it was 🙂 WooTube has been out for nearly a month, and it seems like it has been well received, even though there isn’t any fancy homepage layout for it. But now there is! A few hours of coding, and voila, an optional homepage layout, which you can turn on from within your options panel. This will add post boxes on the front page, and you have the option of showing the latest video, or disabling it and getting that gallery feel on the theme. This theme can therefore easily be used as a normal blog/gallery/portfolio or whatever you can imagine it to be. There is no need to add videos to your posts, so you could use it to show of your design work, or run a CSS gallery. If you already own WooTube and want to know how to upgrade, you should study the changelog.txt and first backup your current theme if you have made any changes to the files. Let us know your thoughts on the upgrade by checkint out the demo, and if there are any more tweaks that we should add. Very cool fellas! Love the homepage. I may use this theme for a redesign of one of my sites. I have a question though, what would a category of regular posts look like? Just text, or pictures, etc. Not videos. How would the archive and the single post pages look with just text? Other than that, I think this may be perfect for what I’m looking for. Very cool Magnus. I guess what I’m asking, is could you maybe have a sample on the demo, that shows what a category archive, single post, etc would look like in a category with only text/image/portfolio posts? Hey Nick, The archive with custom homepage activated has boxes with images in them. If you disable custom homepage, you are left with the old layout where a category view will only show the latest post in that category, and then show the rest of the posts in that cat in the video browser. 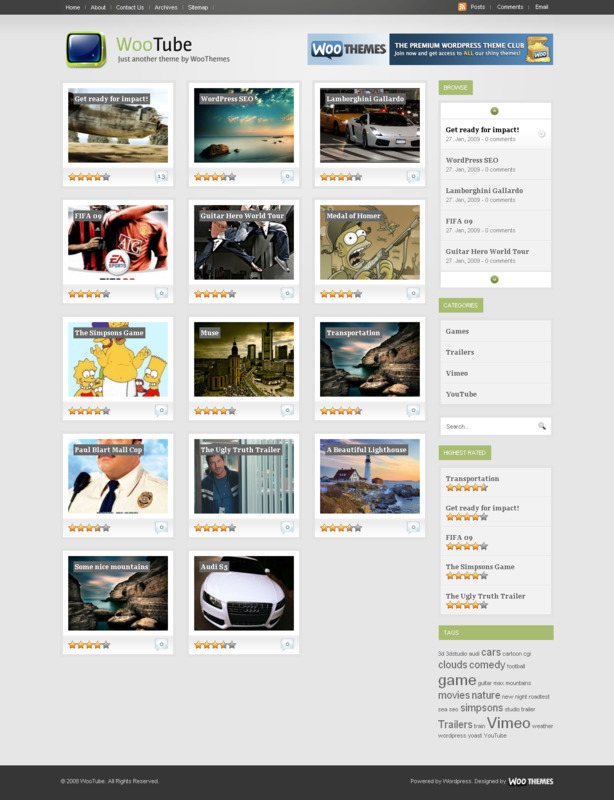 Demo looks great, I was looking for a theme like this and it will perfect for my sites. Can this theme work with youtube videos?? First thanks for this theme. I want to ask question can we change boxes size in homepage ? I want to have more boxes in one line. ( 4- 5 etc. ) Thanks again..
What is the twitter mod in v1.1.2? Great looking theme. Quick question.. I have an existing video gallery WP site and getting my head wrapped around how it’ll transfer to this theme. How are the thumbnails created? Manually within the media gallery? Does each post use custom fields?